As Singaporeans mark the nation's bicentennial year by reflecting on how it came into being, Prime Minister Lee Hsien Loong urged them to also "think of how we can move forward together". 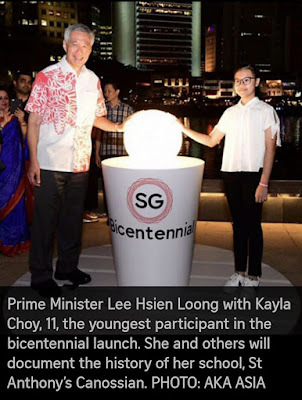 Noting that Singapore is always a work in progress, he said at the launch of the Singapore Bicentennial yesterday: "It is every generation's duty to keep on building, for our children, and for our future." In doing so, Singaporeans not yet born will have, in another 50 or 100 years, a richer and greater Singapore Story to tell. It will be, he added, "one that we will have helped to write together". The year-long bicentenary, which will feature, among others, projects by artists, schools and ethnic associations, started along the Singapore River to understand where Singapore began, and will close at Marina Bay to look forward into the future. Following his speech, PM Lee, and political and community leaders saw a visual representation of much of the historical milestones he spoke about, in a multimedia light show, called Bridges Of Time. Using light, sound, projection and water, and set against the city skyline, it tells the story of a traveller who sails through time and space to reach a mythical island - Singapore. The group then toured the Civic District where projections depicting different nuggets of history were cast onto the facades of neighbouring monuments. Earlier in his address, the Prime Minister spoke about Singapore's separation from Malaysia, saying that both parting ways in less than two years after the merger was not surprising, in retrospect. Tracing events since Sir Stamford Raffles established Singapore as a free port, he said: "Over nearly 150 years, our political values, inter-communal relations, and world views had diverged from the society on the other side of the Causeway." Its identification as South-east Asian and Malayan, seeded in 1819, drove Singapore to join the Federation of Malaysia in 1963, he added. But as a British colony, Singapore was never governed as part of Malaya and that made "us quite different from our neighbours and friends", said PM Lee. He also noted that even before the British came, Singapore already had a thriving seaport called Temasek at the mouth of the Singapore River. That was back in the 14th century. In the 16th and 17th centuries, Europeans who came to South-east Asia knew about the island. When Raffles arrived in 1819, his establishment of Singapore as a free port was a "crucial turning point in our history", the PM said, as "it set this island on a trajectory leading to where we are today". The population grew with immigrants, and the streets of Singapore tell of their diverse origins, he noted, citing Malacca Street, Amoy Street, Kadayanallur Street, Bugis Street and Bussorah Street. "Thus, we became a multicultural and open society," he added. Trade, the island's lifeblood, linked Singapore to the neighbouring archipelago and the world beyond, and economic and family ties were developed, especially with the Malay peninsula, said PM Lee. However, Singapore's history since 1819 ensured that it not only survived but also thrived after separation. PM Lee credited the pioneer generation with having the grit and resolve to show they could be masters of their own fate when Singapore left Malaysia. The journey, however, was not without triumphs and tragedies. Paying tribute to the nation's forebears, he said they paid with blood, sweat and tears. They cleared the jungles, and planted nutmeg, gambier and rubber. Indentured coolies slaved at the quayside. Resourceful traders built import and export businesses, creating prosperity. In the process, communities were formed to help one another, including Chinese clans, welfare bodies like the Sree Narayana Mission and cultural groups like Angkatan Sasterawan'50. "Over two centuries, all these different strands wove together into a rich tapestry, a shared sense of identity and eventually, a Singapore identity and nation." PM Lee said he is glad that more than 200 groups and organisations are holding commemorative events for the bicentenary. "Their stories and journeys are the personal experiences and collective memories that give life and meaning to the Singapore Bicentennial story," he said. Taking a walk along the Singapore River now comes with a new experience. A new augmented reality (AR) trail by the National Heritage Board (NHB) has been designed to bring Singapore's history to life. For instance, scanning an AR marker outside the UOB Plaza at Boat Quay via the new BalikSG app will reveal a scene from the 1880s. Users will get to see shophouses and godowns (warehouses) lining the river, bumboats bobbing in the water as well as coolies straining to heave sacks of goods near the busy promenade. The free BalikSG app was announced yesterday as part of the bicentenary's official launch by Prime Minister Lee Hsien Loong. The app's Singapore River trail, which covers Singapore's colonial past, has eight stops which can be accessed in any order. It spans about 2km and takes about two hours to complete. The NHB's strategic communications and digital manager, Mr Nicholas Chen, said they tapped the collections in the National Museum and National Archives to put together the app, which took about a year to complete. The app also comes with write-ups and old photos. He said: "We hope to present heritage and history in a fun and interactive manner so as to reach out to people who don't usually visit a museum." At three stops, app users will be able to get acquainted with representatives from communities such as the coolies, Chettiars - Singapore's first financiers - and a pondok chief, who took care of the welfare of Baweanese immigrants who lived in communal shelters called pondok. Actors in era-appropriate garments retell these community stories. Another highlight of the trail is the stop at the Raffles Landing Site near the Asian Civilisations Museum. Users will get to experience for themselves an illustrated animation of a tete-a-tete between Sir Stamford Raffles and Major William Farquhar after they landed in Singapore on Jan 29, 1819. Near the Padang, users will get to see a panoramic re-enactment of the signing of the 1819 treaty - which allowed the British East India Company to set up a trading post in Singapore - with Temenggong Abdul Rahman and Sultan Hussein Shah of Johor. The illustrated animation depicts a rainy day at the Padang, as it was documented some years later in the Hikayat Abdullah, an autobiography of Munsyi Abdullah, who was Raffles' scribe. The book noted that "by God's power there fell a light rain", which the Malays reckoned "is a sign of blessings to come". The National Parks Board, which was also involved in the development of the app, will launch an AR trail around Fort Canning in June. On Jan 29, 1819, Stamford Raffles, accompanied by William Farquhar and a small entourage, arrived in Singapore. His objective was to establish a port and trading station for the East India Company. This is the beginning of the story of modern Singapore. Our founding Prime Minister, Mr Lee Kuan Yew, held this view. Speaking to the Singapore International Chamber of Commerce on Feb 6, 1969, he said: "But for the wisdom and foresight of the Englishman with whose name the history of modern Singapore will always be associated, your Chamber, you and I, all of us would not be here today." Singapore's founding fathers were famous for many things. One of them was their disdain for political correctness. They preferred the truth to fashion and never shied away from defying convention. Speaking at the banquet, Mr Lee said: "... we deem ourselves among the fortunate few who can afford to be proud of their past, with no desire to rewrite or touch up the truth. It is a short history, 150 years, but long enough for us to value our association with the British people." 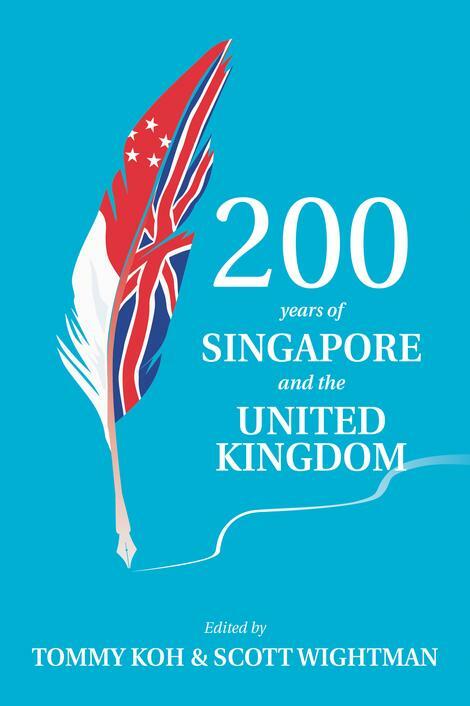 Singapore and the United Kingdom have a 200-year-old relationship. 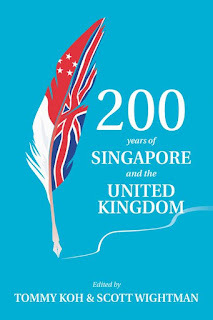 To commemorate the bicentennial, my friend Scott Wightman, the British High Commissioner, and I have co-edited a book, entitled 200 Years Of Singapore And The United Kingdom. It will be launched today by Minister for Culture, Community and Youth Grace Fu. In 2017, Indian politician and intellectual Shashi Tharoor published a book, Inglorious Empire, about the British rule of India. Dr Tharoor accuses the British of having destroyed India, economically, culturally and psychologically. I regard his book as a good counter to Prof Ferguson's book. We acknowledge that Singapore had been settled, not continuously, but intermittently, since the 14th century. We have therefore included essays by historian Kwa Chong Guan and archaeologist John Miksic on Singapore's pre-1819 history. In his speech on Feb 6, 1969, Mr Lee said: "When Stamford Raffles came here 150 years ago, there was no organised human society in Singapore, unless a fishing village can be called a society." Mr Wightman and I both feel that Raffles has been given too much credit and Farquhar, the first Resident, too little for his contributions to the success of Singapore. Raffles was the visionary; Farquhar was the pragmatist who turned the vision into reality. No one did more for the success of Singapore, in the first four years, than Farquhar. Mr Graham Berry has written an excellent essay to set the record straight. We hope that, in this bicentennial year, the Singapore Government will acknowledge our debt to Farquhar in an appropriate way. Two hundred years is a long time. We are able to select only a number of key milestones and requested some experts to write on them. For example, we have an essay by Associate Professor Peter Borschberg on the two treaties of 1824: the Anglo-Dutch Treaty and the Crawfurd Treaty. It was under the Crawfurd Treaty that the British obtained sovereignty to Singapore. We have an essay by Mr Kennie Ting on Singapore's port city heritage. He is an expert on port cities and is the author of a new book, Singapore 1819: A Living Legacy. Associate Professor Farish Noor has written an important essay on migration and multiculturalism in colonial Singapore. When Raffles founded Singapore, he appealed to Chinese, Indian, Arab, Jewish, Armenian and Western traders and entrepreneurs to come to Singapore. Many answered his appeal. Farquhar was able to use his reputation and network to persuade Malays, Bugis, Javanese, Acehnese, Boyanese and Minans to join the settlement. Prof Farish concludes that due to the fact that the settlers came from so many parts of Asia, "they gave to the land that they would adopt as their home a multi-perspective worldview that would ensure that Singapore remain a hub in the globalised post-colonial world to come". Other milestones covered in our book include the Indian mutiny of 1915, World War II, the Japanese Occupation, Subhas Chandra Bose and the Indian National Army, the rise of nationalism and anti-colonialism, and the political developments between 1945 and 1963, and from 1965 to the present. On the topics of merger and separation, we decided not to request two Singaporeans to write on them as we are all familiar with the Singapore narrative. To add value, we decided to invite British historians A.J. Stockwell and Nicholas J. White to do so. There is also a noteworthy essay by Mr J.Y. Pillay on the decision by the British government to withdraw from its military bases in Singapore by 1971. This was a big blow to the newly independent government, which was faced with high unemployment and the lack of job opportunities. It was estimated at the time that the withdrawal would mean the loss of 10 per cent of our gross domestic product. Miraculously, Singapore survived this early setback. The story is worth telling. The biggest chapter of the book is on the British legacy in Singapore. We have many good essays on the English language, the rule of law, the free port, free trade, open economy, the civil service, health, education, welfare, town planning, low-cost housing, anti-corruption, business, sports, culture, the Commonwealth and so on. The British left a rich legacy in Singapore. However, it is fair to say that, in many instances, the British had laid the foundation but it was the Government of independent Singapore that got the job done. This is true in the fight against corruption, in town planning, in the building of low-cost housing, in diversifying the economy, in cleaning and greening the city, and so on. Ms Irene Ng and Mr Alan Hunt have written about the transformation of the relationship between Singapore and Britain, from 1965 to 2019. Ms Foo Chi Hsia and Mr Wightman have written about the future of our relationship, post-2019. The British colonial administration in Singapore did not observe the democratic norms and freedoms that the British citizens enjoyed at home. Anyone deemed to be critical of or disloyal to the British could be banished to the land of his birth. To be fair, I must also say that there were many good people from Britain who were working in Singapore, as doctors, lawyers, engineers, architects, teachers and so on. In RI, I had several expatriate teachers. I remember three of my teachers, Mr T.J. Evans, Mr J.T. Lippit and Mr W.T. Andrews, with respect and gratitude. To sum up, I would say that the British rule of Singapore was 60 per cent good and 40 per cent bad. However, compared with the other colonial rulers in South-east Asia, the British were the least bad. They left us with a rich legacy. We were able to build on that legacy and to catch up with and even surpass Britain in some respects. Over the past 200 years, the relationship between us has been transformed from that between the ruler and the ruled, between a rich country and a poor country, between a developed country and a developing country, into a relationship between two equals. When Britain leaves the European Union on March 29, it will be in uncharted waters. I want to say to our British friends that they have our goodwill and support in their new journey. I have a final thought. I think we should remember the hard work and sacrifice of generations of Singaporeans. It is the collective efforts of these people, over the past 200 years, which have produced the success story called Singapore. Professor Tommy Koh, a veteran diplomat, is chairman of the Centre for International Law and rector of Tembusu College, both at the National University of Singapore.